A useful method that organizations use to help them determine which goals to establish at the departmental level is called a SWOT analysis. 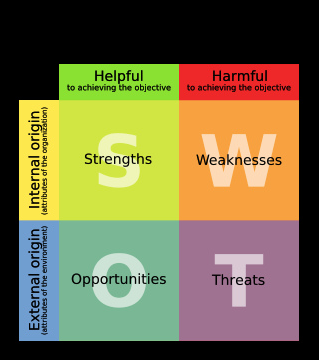 A SWOT analysis is a tool used to identify strengths and weaknesses and to examine opportunities and threats employees face in the organization. 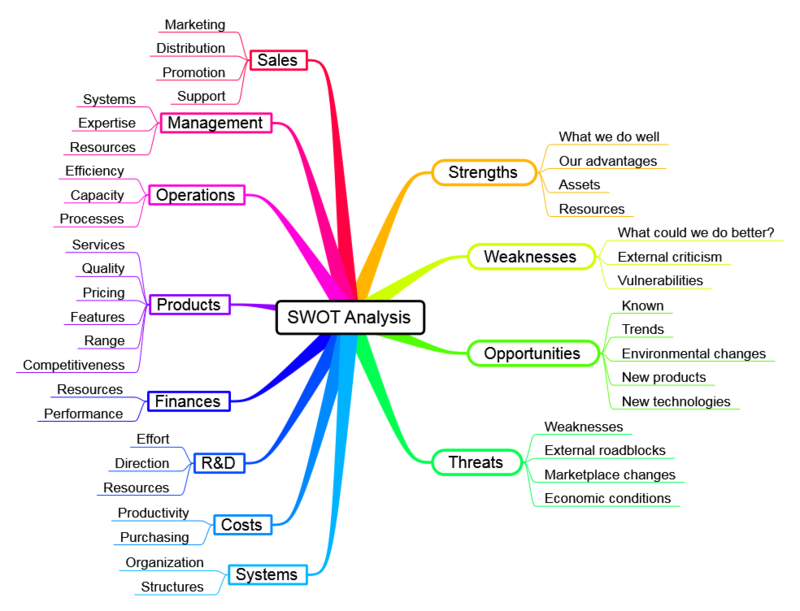 Conducting a SWOT analysis helps management to focus on specific activities and set goals for those areas where the organization is the strongest and has the greatest opportunities to achieve success at. Once these three activities are completed, the organization will need to answer questions about the strengths, weaknesses, opportunities, and threats. Consider strengths from your point-of-view, as well as from the points of view of the organization, customers, and stakeholders. Also, think of your organization’s strengths and weaknesses in relation to your competitor. A way to determine opportunity areas is to look at strengths with an eye for building on them, or to look at weaknesses to determine whether eliminating any of them could create opportunity. For this rotation within the Individualized Supervised Practice Pathway (ISPP), graduate students/dietetic interns are required to review the Management Quality and Process/Performance Improvement (MQPPI) objectives. We are to discuss breakfast sales with the General Manager(s). Then, with information from these 2 sources, we are responsible to for the development of a marketing campaign to improve breakfast sales. The undergraduate students in our groups are also contributing to the project by applying the 4 P’s of marketing (Price, Product, Place, and Promotion). Overall, this project will count towards the 80 hours for my MQPPI project(s) section within this rotation. My first plan of action for this project is to apply a SWOT analysis of the breakfast sales at Taziki’s Mediterranean Café in the WVU Mountainlair. I aim to address what the strengths and weaknesses are within the breakfast menu and its targeted audience. In addition to this, I will also address what opportunities that the breakfast menu could potentially have and how I could assist in that happening. And lastly, I will also investigate and report what the potential and/or existing threats are to the sales of breakfast. The final report is due the week of July 22nd, 2013. – What does Taziki’s Mediterranean Café (including breakfast sales) do well? – What advantages do they have? – What relevant resources can they access? – What do they do for their customers that exceed their expectations? – What do they do better than their competition? – What do other people see as their strengths? – What does Taziki’s Mediterranean Café (breakfast sales) do badly? – What could they improve? – What should they avoid? – Where are they lacking in customer service? – What does their competition do better than them? – What trends do they see that could boost demand for their products/services over the next five years? – What opportunities do they think will emerge because of what is going on in the community? – How might technology help them? – What change could occur in the future that could benefit Taziki’s Mediterranean Café? – What trends do they see that might hurt demand for their products/services over the next five years? – What obstacles are they facing? – Do they have cash flow problems? – What might threaten them because of what is going on in the community? – What change could occur in the future that would hurt Taziki’s Mediterranean Café? What Does “Team Growth” Mean to You? A team, especially one that is in a foodservice operation, has four distinct stages of group development. The four stages of group development were created by Dr. Bruce W. Tuckerman after observation of the different phases in the development and maturity of groups of people. The first stage is forming. This is where teams are getting to know each other, as well as learning what will be required of them in order to achieve their assigned goal. This stage is defined by the way the team members approach each other and inspect the limitations of group behavior. The group is also evaluating the manager’s role and leadership. Throughout this stage, the manager takes a larger role in directing the progress of the team. Directing involves telling the group what specifically needs to be accomplished, establishing guidelines, and providing specifics on the five Ws (Who, What, Where, When, Why) and How. At this point, the team members are focusing on being part of a team. The second stage is storming. At this point, the reality of the project sets in for the team and various interpersonal struggles begin to surface. Typically, this is the most difficult stage for any team to get through, since power clashes and competition between team members are common and are easily seen here. Besides this realization, team members become impatient with their lack of progress and rely more on individual approaches instead of teamwork. At this time, the manager needs to utilize a coaching style to clarify and explain tasks repeatedly. The manager will need to persuade team members often to work together and refocus their efforts. 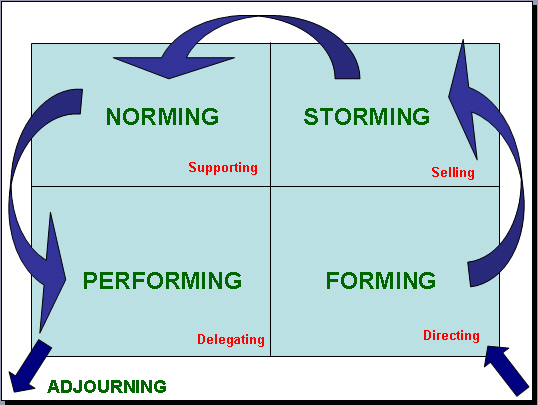 The third stage, norming, sees team member settling their differences and developing more cohesive and trusting relationships. The team realizes that they can work together and help each other achieve success. The members understand the team’s needs and accept the team ground rules and the roles that each person plays in achieving the project goals. Conflict decreases as these realizations occur and team members develop more confidence in their ability to work together and accomplish the task. At this time, the manager transitions into a leadership style of supporting the team by providing encouragement, listening more than telling, and promoting team discussions. At last but not least, the fourth and final stage is performing. This is where team interdependence is recognized. 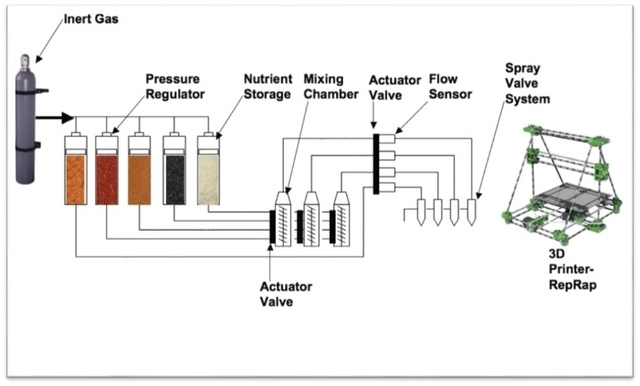 Team members can analyze and solve problems successfully together. They have accepted each other’s strengths and weaknesses and can adapt to meet the needs of each member. The team becomes very productive and truly adds value to the organizations. At this point, the manager can use a delegating style. The manager no longer needs to provide much direction and can periodically monitor the team’s progress with update meetings. Since my summer in the WVU Individualized Supervised Practice Pathway (ISPP) dietetic internship is primarily focusing on the Institutional Food Service, Production, and Management rotation, I thought it would be fitting that I talk about the importance of teamwork. The importance of teamwork has been proven to be effective in today’s fast-pace foodservice organizations. The use of teams has become an unavoidable solution at tackling some of the pressing challenges that managers face in the food industry. Whether it be from finding ways to reduce costs or to increasing overall sales, all of these issues usually impact more than one department and can benefit from a multi-perspective approach. The companies or organizations that use teamwork and team-based activities will be better prepared to make necessary decisions to adjust to supply and to meet customer’s demands. Yes, individual employees can make a difference to an organization, but no single person has enough knowledge, creativity, or experience to tackle some of today’s complex problems. Remember, two heads are always greater than one. 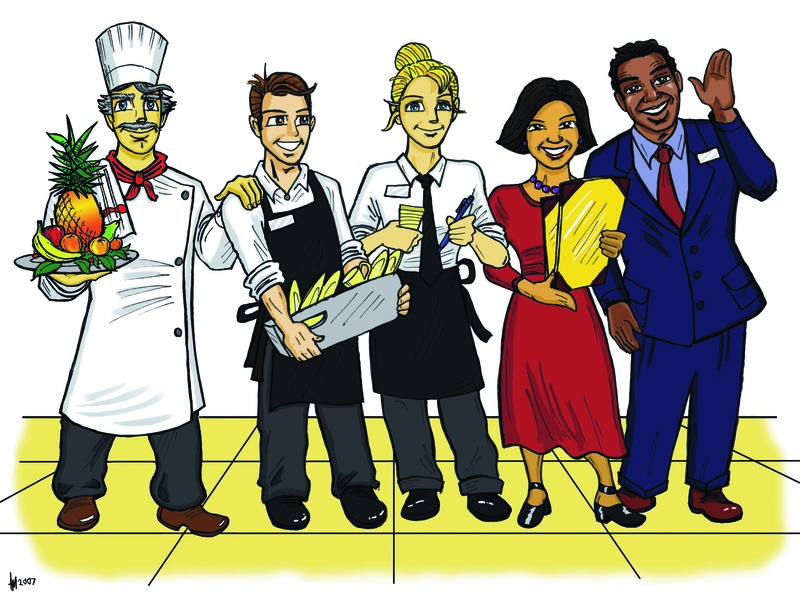 Several foodservice systems look to managers to influence teams whenever and wherever possible. Essentially, a team is a group of individuals who operate as a unit for an assigned goal. 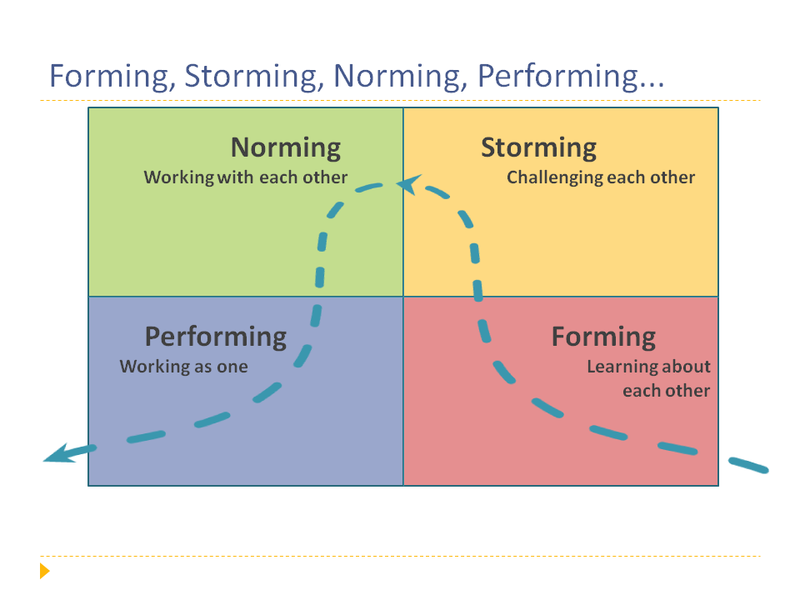 Teams differ from other work groups because they typically have performance goals to achieve. 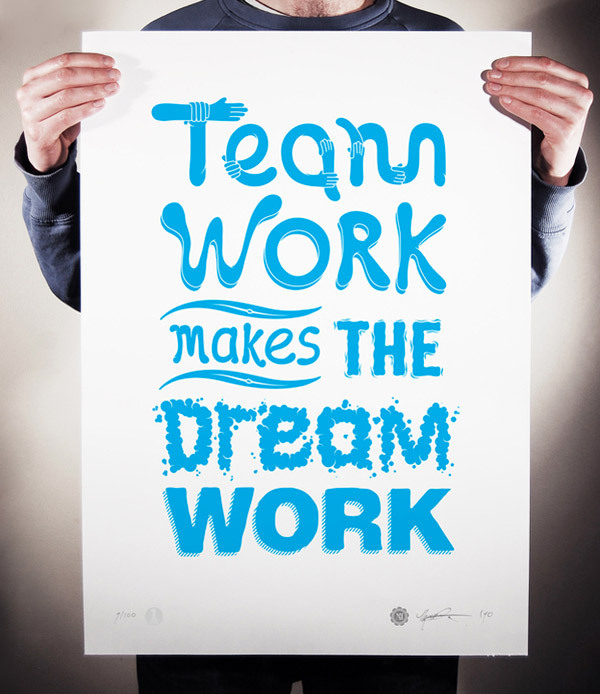 Team members usually feel some type of accountability for working together to achieve these goals. So, teamwork is the actual state of acting in a collaborative and cooperative effort to create positive results for the achievement of one common goal. For example, my group at Taziki’s Mediterranean Café had one of our group members drop the Business class. So, instead of panicking or blaming each other for common mistakes that we might have made that next day, we worked as a group and everyone helped each other at their designated stations. And it even brought us closer together as a team because we know that all 3 of us rely on each other, as well as the management of course too. And to be honest, I think that we’re performing even better as a team now because we were somewhat forced with a fight or flight situation. 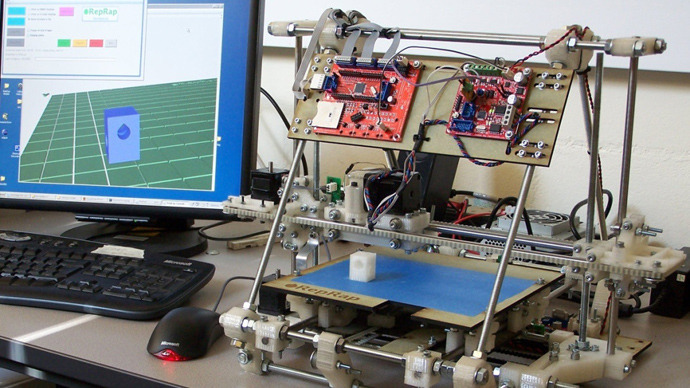 Technical expertise is a core competency that every team needs. The type of problem that will be assigned to a team dictates to a certain extent what expertise you will need to bring together. Skill in several areas may be needed, depending on the problem at-hand. 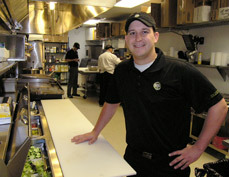 For example, if Taziki’s Mediterranean Café was researching a new menu item to offer to customers, a team of dietitians, food prep specialists, servers, operations personnel, and marketing specialists would supply the necessary blend of experience to ensure a thorough analysis of what customers want, rather than just a team made of one of these groups listed. Using the knowledge and skills of a cross section of an organization will strengthen the likelihood of a team reaching its goal. Problem-solving skills are needed by teams to identify the root or underlying cause of a situation or challenge. These skills are also needed to identify potential solutions and trade-offs. Initially, a team needs to have at least one member with this capability. As the team progresses, more team members should develop these important skills. Interpersonal skills is the third and final category of team skills. Members who communicate effectively and facilitate a group process are critical to the success of a team. Team members who possess these skills help produce an environment of directness and confidence that allows the team to flourish and make progress towards their goal. Balancing all 3 of these skills is essential f or a manager to consider when working with a team. The Summer of Institutional Food Service, Production, and Management Rotation Begins! Well this week marked the kick off to my summer of my Institutional Food Service, Production, and Management rotation within WVU’s ISPP dietetic internship. Within this rotation, I am required to have a minimum of 240 hours of experience in a food service production system. Along with these hours, I have a set of objectives to complete as well. Since Taziki’s Mediterranean Café has partnered with our Didactic Program in Dietetics (DPD), I will be doing my rotation at WVU’s downtown campus’s Mountainlair location. The rotation is also attached to a class affiliated with the College of Business and Economics at WVU as well. So, not only are there other nutrition students working alongside me this summer, but there are business students registered for this class as well. – Hold a cumulative ServSafe review session for the undergraduates enrolled in the class on July 30th. – Develop a marketing campaign to improve breakfast sales with the undergraduates in my group. (I’m the only Graduate student in my group). This will require me speaking to the General Managers about breakfast sales in the restaurant and apply this information to my Management Quality and Process/Performance Improvement Project. – Develop a FOG BMP Report. This specific report is focusing on sustainability. The report will identify fats, oils, and grease best management practices for Taziki’s AND Martin’s BBQ Joint. – Then, our last project will be split into 2 parts: the Food Systems Project: I’ll work to raise consumer awareness on the need to support local farmers and food. Only time will tell how my rotation progresses! Here is a picture of someone standing in front of my assigned station for the week! According to a new observational research study, the Mediterranean diet may improve a woman’s fertility. The study, completed in Spain, drew a conclusion to the connection between the Mediterranean diet and fertility based on insulin response. The American or Western diet is packed with sugars and processed foods. So, in order for the body to digest and use these foods correctly, an increased amount of insulin is needed. When the body has too much insulin, the other hormones in the body, like reproductive hormones, are not released accurately. The Mediterranean diet, which is loaded with fruits, vegetables, healthy fats/oils, and whole grains, helps to control blood glucose. By helping to control the body’s blood glucose, or insulin response, this can assist fertility and reproductive hormones maintain a healthy balance. 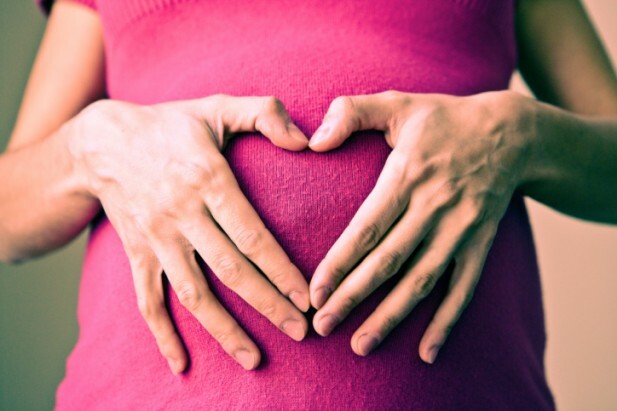 Researchers studied more than 500 women who reported having trouble getting pregnant. Another 1,600 women with at least one successful pregnancy ending in live birth were also included in the study as a control group. The research split the group into Western diet and Mediterranean diet categories. The women in the Western diet category showed no difference in fertility whether they followed a Western diet strictly or loosely. The Mediterranean diet group, however, showed a significant difference in fertility based on how closely women followed the diet. In contrast, approximately 17% of women who followed the Mediterranean diet firmly reported problems becoming pregnant. When women followed the diet loosely, that number jumped to 26%. 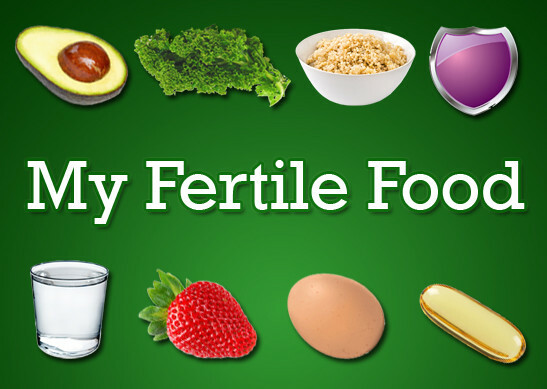 So, you can see that nothing is absolutely proven with the diet and fertility… yet. Not all doctors are convinced about the connection. There isn’t enough information to show that this diet pattern can assist a woman at becoming pregnant. Also found in a new research study, diets containing foods rich in monounsaturated fat, like green fruit, olive oil, peanuts, almonds, and cashews, could triple chances of women becoming pregnant via fertility treatment. Health professionals believe a diet similar to this could assist most women wanting to become pregnant naturally as well. In this study, it was clear that consuming a diet high in saturated fat, found in dairy and red meat, appeared to impair women’s fertility. Diets high in saturated fat have also been linked to lower sperm counts in men. The School of Public Health at Harvard looked at how the intakes of different types of fats affect success rates of IVF treatment in women mostly in their 30s. The study found the women who ate the most monounsaturated fat had up to 3x the chance of giving birth via IVF, compared to those who ate the least. People everywhere are looking for easy and affordable ways to add healthy protein to their diet. It seems that eggs appear to be the perfect little protein package. But since the advice from health professionals seems to change often about eggs, consumers are becoming increasingly confused. Healthy consumers really shouldn’t worry about this but, individuals who at-risk for cardiovascular disease (CVD) or who have CVD, may want to be aware of this. What seems to be more important than the food itself is the total cholesterol intake from food. Regardless of where the cholesterol comes from, like eggs or other animal products, consumers who are more susceptible to CVD should keep account of the cholesterol and saturated fat that they are consuming from these food sources. Remember that eggs are contained in many foods, including bread, cakes, ice cream, muffins and even such entrees as breaded fish, meat dishes and meatloaf. Each of those might add just a fraction of an egg per serving, but together they can increase your cholesterol intake, especially since many of those items contain other ingredients that can be high in cholesterol and saturated fat, such as butter or cream. Consumers should be careful about not confusing dietary cholesterol with blood cholesterol (LDL, HDL, and triglycerides). The major contributing factor of blood LDL cholesterol is saturated fat. 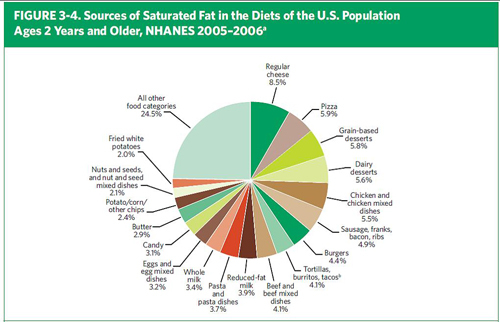 There is a recommendation to limit dietary sources of saturated fat, largely found in dairy and animal protein. Although the saturated fat in eggs is relatively low compared with that in many other animal-based protein sources (one large egg has less than 2g of saturated fat), many of the foods that often accompany eggs (such as bacon, butter, cheese and sausage) are high in saturated fat as well. The combination of foods high in cholesterol, like these, can really add up. According to the 2010 Dietary Guidelines for Americans, cholesterol intake by men averages about 350 mg per day, which exceeds the recommended level of less than 300 mg per day. Average cholesterol intake by women is 240mg per day. Independent of other dietary factors, evidence suggests that one egg (including egg yolk) per day does not result in increased blood cholesterol levels, nor does it increase the risk of cardiovascular disease in healthy people. Consuming less than 300mg per day of cholesterol can help maintain normal blood cholesterol levels. Consuming less than 200mg per day can further help individuals at high risk of cardiovascular disease. On the plus side, eggs have many nutritional benefits. 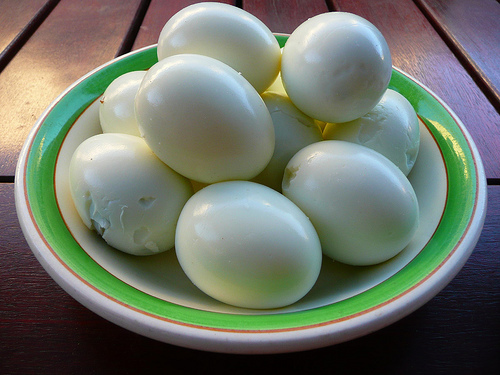 They’re a good source of high-quality protein, with relatively few calories (6.3 grams of protein for only 72 calories in a large egg). Eggs also contain vitamins B12 and D, and several essential micronutrients, including choline (important for brain health) and lutein (for eye health). Tucked away in the Pennsylvania city of Pittston, this place gained fame in the late 19th century as a coal mining center. Today, Pittston is promoting itself as “The Quality Tomato Capital of the World”. 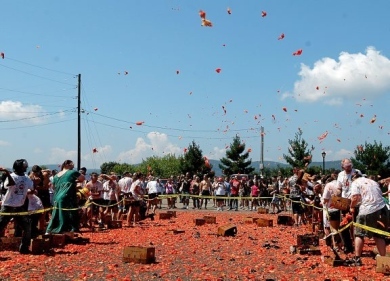 The Pittston Tomato Festival in its 30th year is held annually to celebrate the city’s tradition and heritage in promoting the tomato. 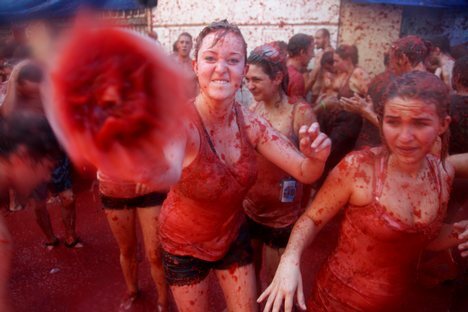 The festival includes multiple food vendors from the area, a beauty pageant, tomato tasting contest, a best looking and ugliest tomato contest, a 5K run through the city, tomato fights, live entertainment, and even a parade! Over 50,000 people attend the 4-day festival that has been crowned as one of the best festivals in Northeastern PA.
Last week, international agricultural leaders met in Washington, DC to discuss plans to dispense and develop agriculture data collected in various countries to report global food security and nutrition. Nutrition security is defined as secure access to an appropriately nutritious diet (ie, protein, carbohydrate, fat, vitamins, minerals, and water) coupled with a sanitary environment and adequate health services and care, in order to ensure a healthy and active life for all household members. Nutrition security requires that all people have access to a variety of nutritious foods and potable drinking water; knowledge, resources, and skills for healthy living; prevention, treatment, and care for diseases affecting nutrition status; and safety-net systems during crisis situations, such as natural disasters or deleterious social and political systems. Food security is a part of nutrition security and exists when all people, at all times, have physical, social, and economic access to sufficient, safe, and nutritious food to meet their dietary needs and food preferences for an active and healthy life. The four pillars of food security are availability, access, utilization, and stability. Although nutrition security requires food security, the two terms are sometimes merged into the term food and nutrition security to emphasize both food and health requirements. Two important limitations with current food security measurements are that the term food is generally equated to food energy only, usually from just a few staple foods, failing to measure the wide variety of foods that are needed to provide all the nutrients for an active healthy life; and terms are often used incorrectly and/or interchangeably for hunger (a feeling/scarcity of food), undernourished (lacking nutrients), malnourished (poorly nourished), and food insecurity (lack of foods needed for a healthy life). The effect of income on nutrition security depends on the local cost of living and social and political systems providing access to land, food, water, housing, health care, and education. Dramatic increases in international food prices have the greatest impact on low-income, food-deficit countries. The recent financial, energy, and food crises have negatively affected poor consumers through soaring food prices; reduced household income; and reduced health and social assistance. Lack of dietary diversification aggravates the problem. The cause of the food price crisis is not necessarily an underlying shortage in global supply, but a combination of high energy prices, pockets of agricultural failure, the financial crisis, and national policy errors resulting in a general price panic. In some countries, there are also increasing demands on the food supply for feeding livestock and making biofuels. Nations are at a higher risk for volatile food prices if their nutrition security is dependent on global financial systems and oil, such as for producing agrochemicals, operating machinery for harvesting, processing, and transportation. Globally, approximately 30% of children under 5 years old are stunted and 18% are underweight. As growth slows down, brain development also lags behind and, as a result, stunted children are more likely to learn poorly. The global prevalence of underweight and stunting in children under age 5 years is decreasing, but prevalence is still unacceptably high in some regions. Approximately 15% of children are born underweight; however, almost 60% of newborns in developing countries are not weighed at birth. Access to caloric intake in developing nations has increased during the past 40 years. In 1969-1971, 33% of the population had inadequate access as compared with the current estimation of 16% in 2010. Micronutrient deficiencies affect more people (36%) than caloric deficiencies (12%), emphasizing the importance of addressing the quality of food in agricultural systems. Micronutrient deficiencies result in fatigue, lethargy, reduced learning ability, brain damage, reduced immunity, miscarriages and other pregnancy complications, blindness, and goiter, and raise the risk for mortality, especially from diseases such as diarrhea, pneumonia, malaria, and measles. The following five micronutrient deficiencies are of particular concern: iron deficiency, folate deficiency, vitamin A deficiency, zinc deficiency, and iodine deficiency disorder. It is estimated that >1 million children’s deaths worldwide could be prevented with adequate vitamin A and zinc and an additional 24,500 deaths prevented with adequate iron and iodine. Adequate micronutrient status improves health and intellectual abilities and the evidence for addressing deficiencies is compelling, cost effective, and achievable. Sustainability creates and maintains conditions under which humans and nature can exist in productive harmony and fulfills the social, economic, and other requirements of present and future generations. During the last 50 years, the physical and functional availability of natural resources has shrunk faster than at any other time in history due to increased demand and/or degradation of biodiversity, soil, forests, water, and air. This has been compounded by a range of factors, including human population growth, changes in lifestyles, and diets that use more land, water, and energy resources. It is imperative to encourage environmentally responsible practices that conserve natural resources, minimize# the quantity of waste generated, and support ecological sustainability of the food system.6 Individuals can make the biggest single contribution to the environment by shifting to a more environmentally friendly lifestyle. Agriculture contributes to the livelihood of 40% of the world’s population with 90% of farmers owning <5 acres. Agriculture is multifunctional because it produces or contributes to food, medicines, nonfood items, ecological services, livelihoods, social stability, culture, and tradition. The combination of community-based innovations, local knowledge, and science-based approaches maximize output and sustainability of food and water resources. Schools that integrate health and nutrition into their classrooms and communities can become centers of excellence and hubs of knowledge and practice beyond the school-aged child. School meal programs provide complete or supplemental meals to promote nutrition, school participation, and learning potential. Gardens in schools can spread to communities and increase awareness of the importance of good nutrition and dietary diversity. Integrating health and nutrition education into lessons, meals, and gardening activities promotes healthy habits such as dietary diversity, food and water safety, food processing, nutrient preservation, sanitation, and hygiene. – Increase awareness of how current world events relate to malnutrition. o Promote awareness of global nutrition security issues. o Learn about, respect, and understand diverse customs and cultures. o Write articles addressing global nutrition security for your local newspapers, state Academy association, political leaders, and nutrition or health promotion newsletters. o Encourage support for global and domestic outreach efforts promoting nutrition security. o Become actively involved to ensure nutrition security programs support sustainable development. o Establish a class on global nutrition security issues. – Network by joining a professional internationally focused interest group. o Join organizations such as: The Overseas Academy of Nutrition and Dietetics; the Hunger and Environmental Nutrition Dietetic Practice Group of the Academy; the American Society of Nutrition’s International Nutrition Council; the Society for Nutrition Education and Behavior’s International Special Interest Group; the Society for Nutrition Education and Behavior’s International Nutrition Education Division or the American Public Health Association’s International Health Section. o Attend national and international professional meetings that have a strong agenda addressing global nutrition security. o Become familiar with international food assistance and education programs such as Oxfam America, Heifer International, or Bread for the World. – Volunteer in local, national, or international humanitarian assistance efforts and medical missions. – Take a class in global nutrition. o Learn more about the ramifications of domestic policy decisions on world food security (eg, trade, food regulations, import and export tariffs, and foreign aid). o Learn about the policies, programs, and issues related to nutrition security. – As the nutrition experts, registered dietitians and dietetic technicians, registered, can provide continuing education seminars to other nutrition and medical professionals. – Become more “green” as you make personal choices. Personal and national decisions affect our immediate environment and also people and environments in other parts of the world. o Teach others how changes in their eating and purchasing practices can reduce consumption of the world’s nonrenewable resources. o Support sustainable food and water efforts locally and internationally (eg, gardening, water filtering, well construction, fish ponds, and reforestation).